MOSCOW: Kremlin-funded English-language channel Russia Today has given WikiLeaks founder Julian Assange his own TV talk show, the station said this week. Filming for Assange’s television debut is already underway from Britain, where he remains under house arrest outside London while appealing an extradition order to Sweden, it said.Russia Today — considered a Kremlin exercise in image enhancement by critics — said Assange will invite 10 “key political players, thinkers and revolutionaries” for interviews on a show dubbed “The World Tomorrow,” due to air in mid-March. “Everything we do on the air is different from the English-language mainstream, that is something we have in common with Assange,” RT’s editor-in-chief Margarita Simonyan told Reuters. “The show is a perfect fit for RT’s motto: ‘Question more,’” she said. “We are counting on it attracting the interest of a wide audience.”Simonyan refused to say how much Assange will be paid for the chat show.Beamed to 430 million cable subscribers worldwide, the Kremlin channel offers a rare public platform for a man whose WikiLeaks website has come under intense pressure after publishing a raft of secret US diplomatic cables and seen its ability to fund itself crippled. 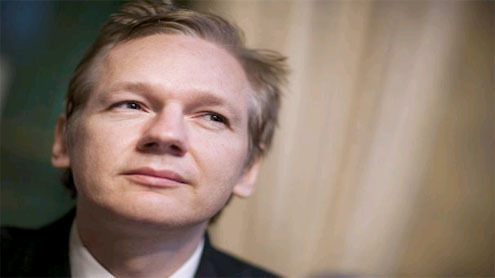 Assange, a 40-year-old Australian, has said the refusal of many financial transactions firms — including Visa, MasterCard, PayPal and Western Union — to work with WikiLeaks have damaged the website’s ability to continue its work.Assange is expected to appear before Britain’s Supreme Court on Feb. 1 to appeal an extradition order to Sweden, where he has been accused of sexual misconduct by two female Swedish WikiLeaks volunteers. Vladimir Putin, who has ruled Russia since 2000 as president and prime minister, has blasted Assange’s 2010 arrest as “hypocritical.”Russia Today kept secret about the names of potential guests, saying only Russian opposition figures may be among them, but speculation was rife on social media websites about who could be invited onto the show. Media analyst Konstantin von Eggert said he expected to see Assange interview Russian allies and anti-establishment guests such as Iranian President Mahmoud Ahmadinejad, Venezuelan leader Hugo Chavez and left-leaning US academic Noam Chomsky.“Julian Assange is famous for his anti-American and anti-Western views, that is exactly why Russia Today is hiring him as a journalist,” said von Eggert, a commentator for Kommersant FM radio.